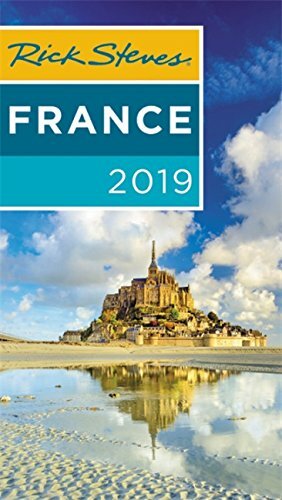 You are here: Home / France / Is it worth visiting Giverny in fall? Hi Frugalistas! For reasons outside my control I often visit Paris in either spring or autumn (fall). It’s precisely for this reason that I had never made the trip to Monet’s garden in Giverny. For some reason I assumed that it was not the right time to visit. That somehow it was only a place for summer. 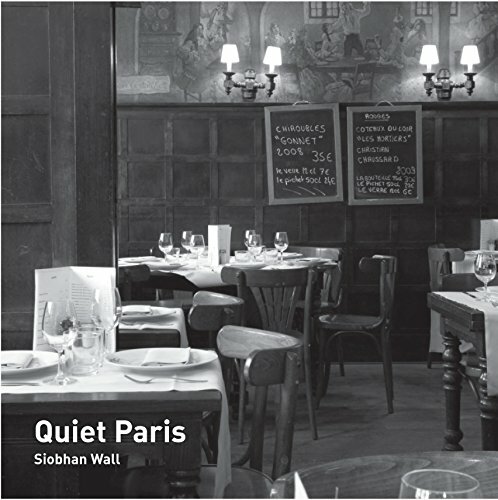 But on my most recent visit to Paris I decided it was time. I would visit Giverny. In October. 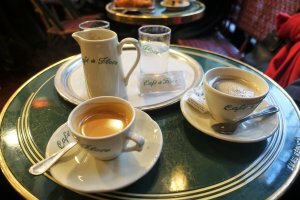 I would find out for myself if it is worth visiting Giverny in fall (autumn) and when was the best time of year to visit Giverny. 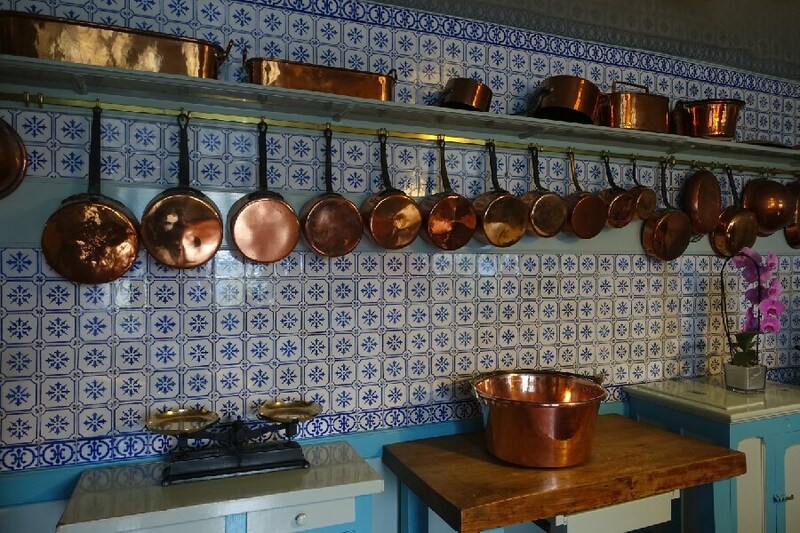 Read on to see what I found…………..
4 Is Giverny worth visiting in fall? I’ll be writing about how to do a trip to Giverny in a separate post, but of course I went first thing in the morning to beat any crowds. Arriving at the entrance there was a queue of maybe 10 people or so waiting to get in. I was in the garden in literally minutes. But then I spotted them. My travel nemesis – the cruise ship tour group. En masse. Clustered around their guide. I went further into the garden towards the house. Fortunately most of the tour group headed straight for the shop. I’d heard stories from friends of queues out the door to tour the house. Not in October. I wandered straight in and spent ages enjoying the colours and Monet’s art work. 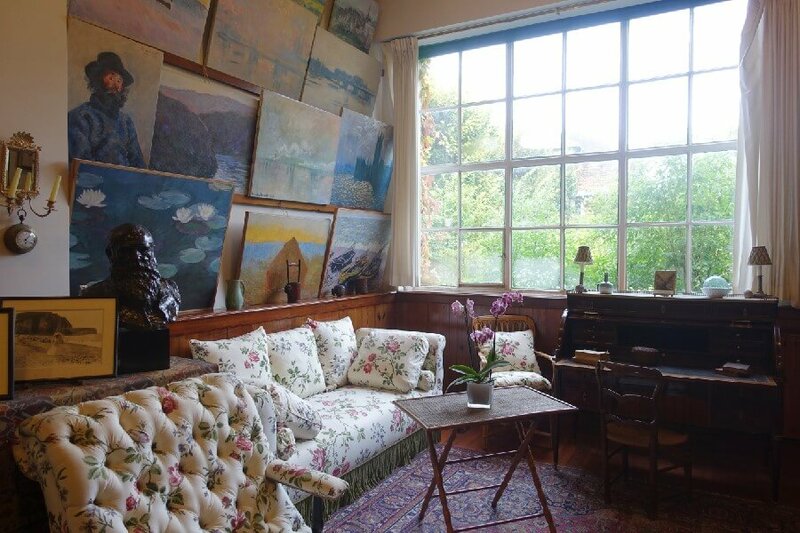 His newly restored studio was a joy that I was able to spend ages in. The newly restored studio. 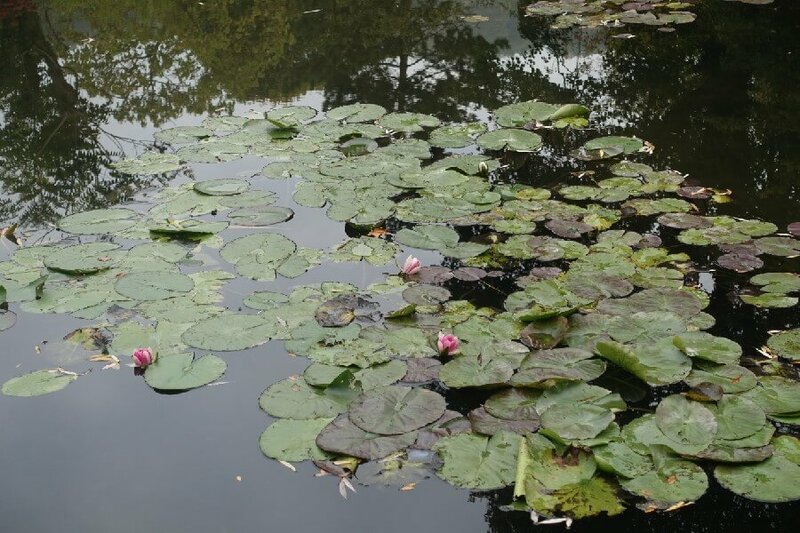 Can you spot the water lilies? Nineteenth century stairs in French buildings are notoriously narrow. And the stairs at Giverny were no exception. But visiting Giverny in October, I was able to run up and down those stairs without anyone else getting in my way, or needing to wait for me. The kitchen was huge, and like all the best parties, everyone seemed to gather there. But it was still OK. Yes, there were plenty of people in there, but there was not so many that you couldn’t move around. There were not so many you couldn’t enjoy its features. People seemed to be conscious of others around them, and were able to move to make room. To let others see. Like all the best parties in the kitchen, a good time was being had by all. While the Monet’s house in Giverny is special, and is lovely, it is the garden that is the star of the show. The garden that Monet painted. 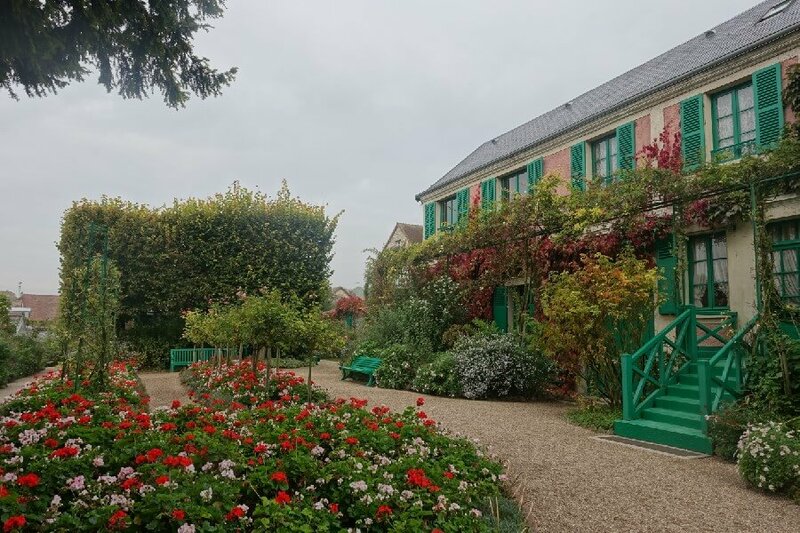 If you know Monet’s works, you know Monet’s garden, and when you visit Giverny that is what you want to see…..
By the time I was finished visiting the house and went into the garden proper the crowds had disappeared. All finding their own special part of Monet’s garden. The first thing I noticed in the garden was colour. Lots of colour. The colour of flowers. The colours of autumn foliage. Yes, the famous archway of flowers was a little bare. But there was still so much to enjoy. I found a little robin – the first one I’d ever seen in France, and as an Australian, a very special treat. 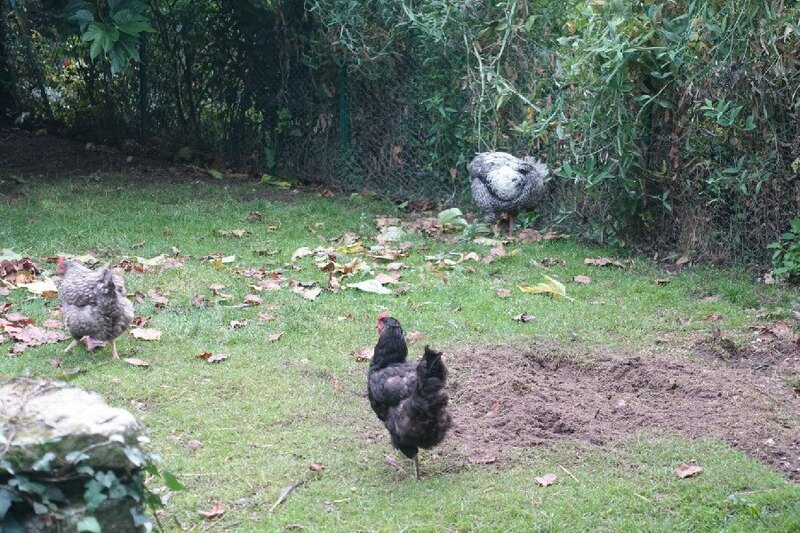 The chickens were running riot. And of course, the flowers were running riot too……. The last of the roses. Not perfect, but perfect for an autumn rose – just as it should be at this time of the year. Beds and beds of geraniums in front of the house. As bright and cheery as they would be in June or July. The real star of the show in the garden at Giverny is undoubtably the lily pond, with its Japanese bridge. Monet painted it over and over. At different times of the year, in different lights. Did he ever paint it in autumn though? Would it be disappointing so late in the season? Arriving at the pond I was stunned. It was beautiful. Just like Monet painted it. The greyness of the day muted the colours like a Monet painting. The last of the water lilies were still out. Just out. But still there. There was autumn foliage on the trees. And there was hardly anybody else there…….. I walked around the pond. I stood on Japanese bridge – the only person on it. The trees reflected beautifully onto the still pond. It was just as I imagined it. Only better. Just one other visitor peeking out it you look very closely……. 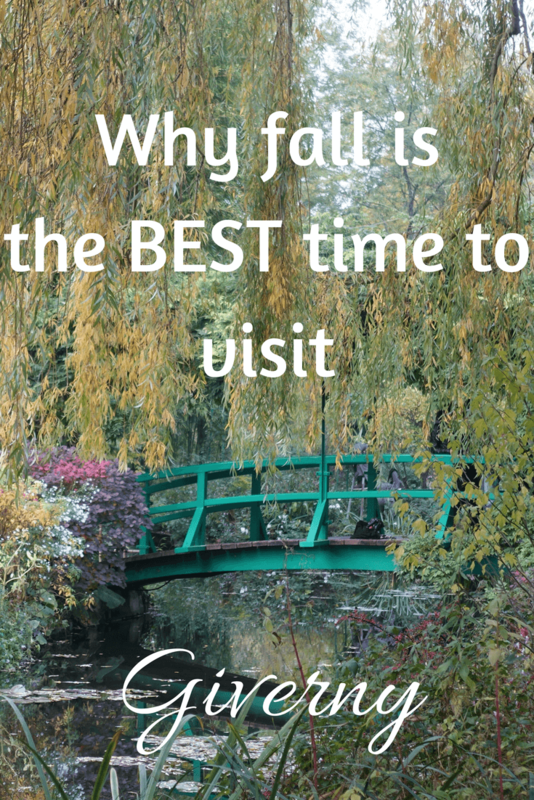 Is Giverny worth visiting in fall? 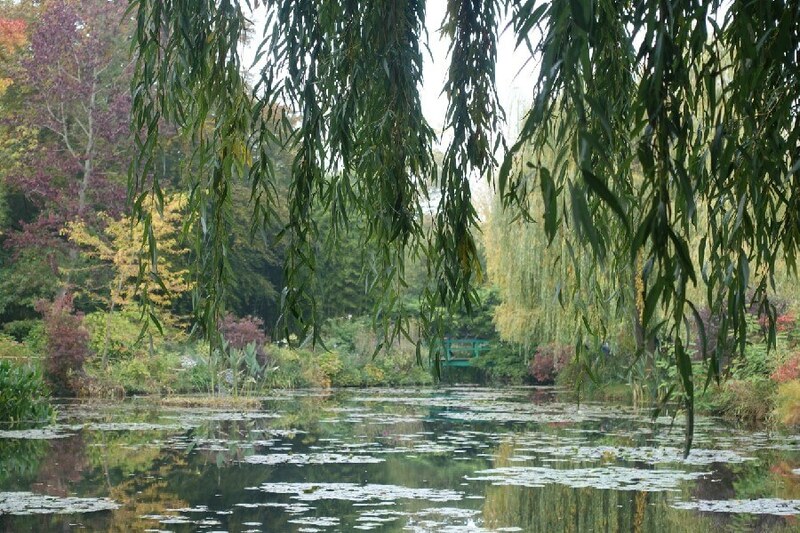 Of course it is worth visiting Giverny in fall. In fact I suspect it is better than visiting in high summer with its heat and crowds. 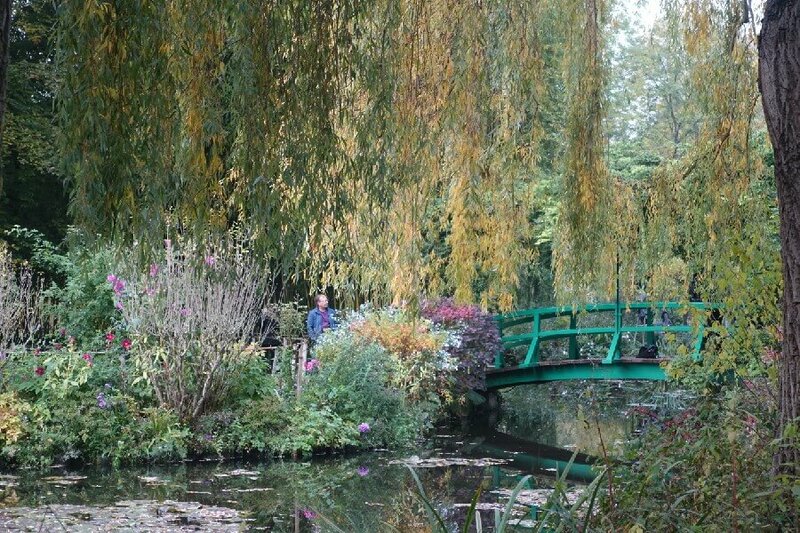 It may be just the best time to visit Giverny in fact. It was quite chilly the day I visited, so warm clothes are recommended. But the flowers were stunning, the colours were extraordinary, and the lack of crowds made it a pleasure to wander around. I was able to enjoy my visit without queuing. Without all the iconic views ruined by tourist hordes. Despite not owning a DSLR camera I’m thrilled with my photos of Giverny. Monet must have seen it like this so many times – With its muted light and hardly anyone else there, I’d like to think it was just as Claude himself experienced. 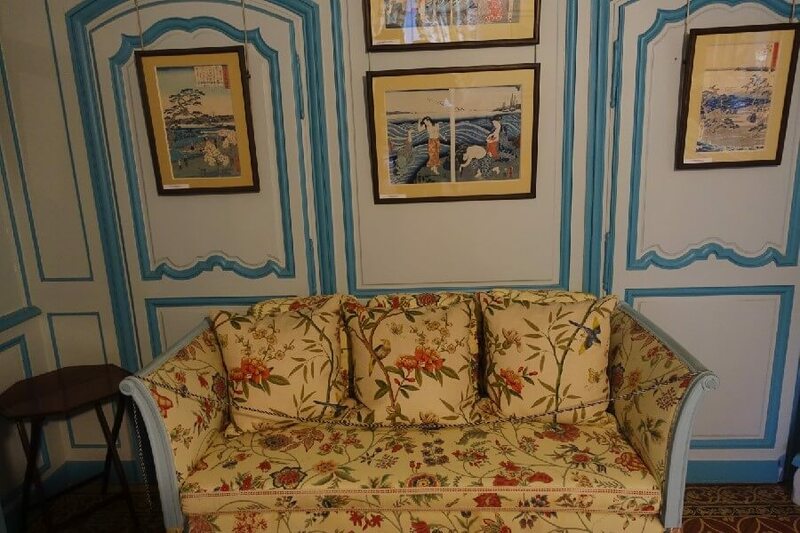 And to me that is a truly luxurious experience……..
Have you been to Giverny? When did you go and what did you think? 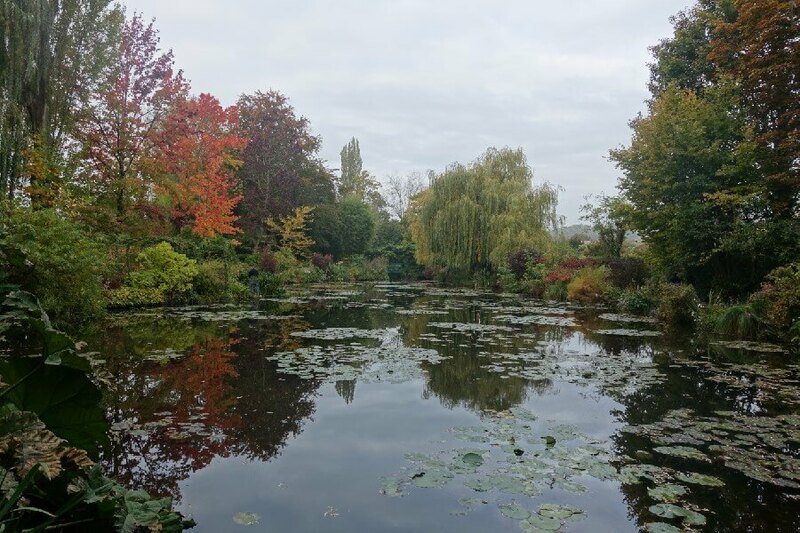 My first Giverny visit was the last day of October. 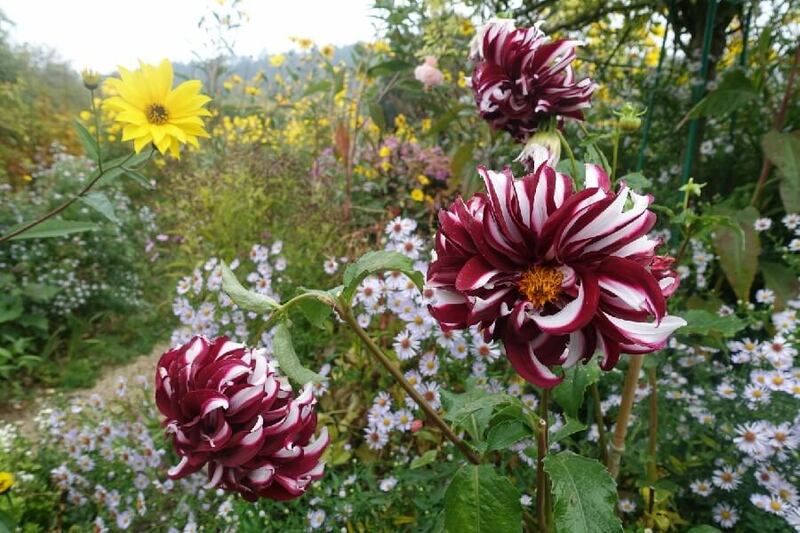 Glorious dahlias amid fall bloom. Most recent visit in late April. Colors & blooms totally different but equally gorgeous! The lily pond – oh my! A guy kept staying in the shot as visitors tried to capture the iconic Japanese bridge. Very funny if it were not so annoying! I don’t even like dahlias normally, but they looked just so right at Giverny! I had been to France a number of times but first visited Monet’s house and gardens mid-May of 2015. It is essential to arrive early, before the entrance opens. Buy tickets online ahead of time and use the lower entry for groups. Yes, there were cruise tours, tour groups, and hordes of people were there by 11am, but we were finished walking all the gardens twice, sitting to enjoy the ponds, and seeing the house interior. 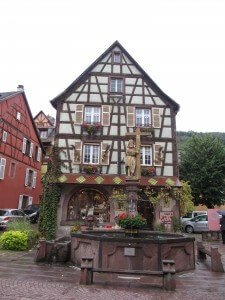 We walked the entire village, which has several nice galleries, shops, restaurants and cafes. We ate lunch, then toured the Museum of Impressionism. To cap the day we walked to the end of the road where the lovely church and cemetery are located. The cemetery is very worthwhile and the small church is lovely. I do think Monet’s gardens are best seen in the incredible colors of spring, but any season would be better than not going there. 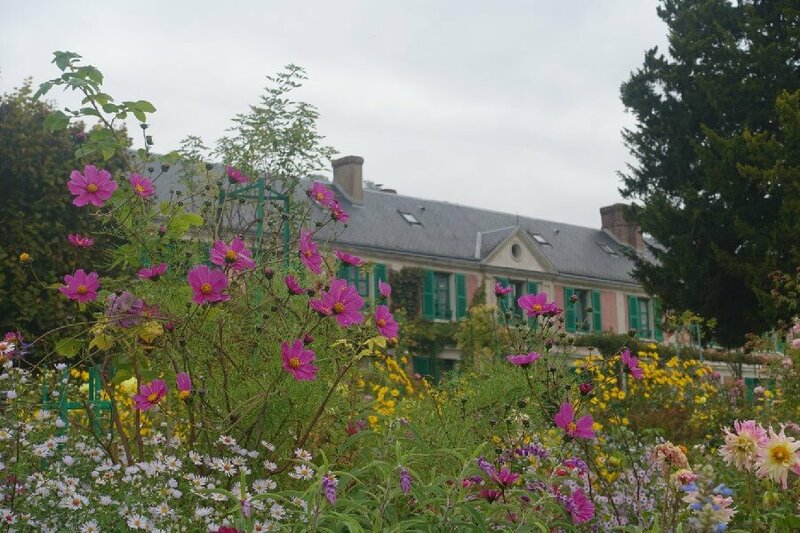 It’s really good to visit Giverny several times, through spring to autumn, to see the different wonderful range of flowers and shrubs in full bloom each time. When we visit we make a full day of it, including walking through the village and lunch in the garden of one of the hotels nearby. The hordes come and they go. But they usually don’t stay long. So while five buses might arrive and people crowd the paths for 20 minutes or so, they’re anxious to get to the shops before their bus leaves. So there are many times during a day when there are only a few people around. At least that’s been our experience – but maybe we’ve just been lucky. I love the house too. So much that when the Monet blockbuster exhibition was on at the NGA in Canberra I visited the special shop set up and ordered enough tiles (the ones in your picture) to tile the splashbacks in our kitchen. 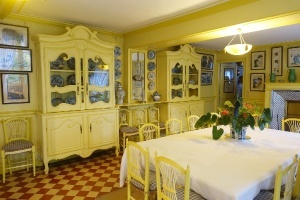 We have a Monet kitchen – at least in colours and tiles. Instead of having Japanese pictures on the wall (as in his dining room) I decided to go with Australian aboriginal art. wow… tempted:) How abut spring? Im sure it’s beautiful!!! I know it is incredibly crowded in summer. Friends of mine were so excited to go, and couldn’t even get into the house the queues were so long…..that’s no fun for anyone. But I’m sure spring is a delight as well! Great article. Cruise ship tour groups – my nemesis too, Haha! They get everywhere. Delighted to find your website, with the answer to my Google search about whether it is worth going to Giverny in autumn. Based on your photos, the answer is yes indeed! Thanks for your most helpful post. 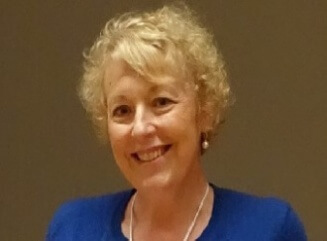 Thanks very much Joanne – I’m glad I was able to answer your question for you. 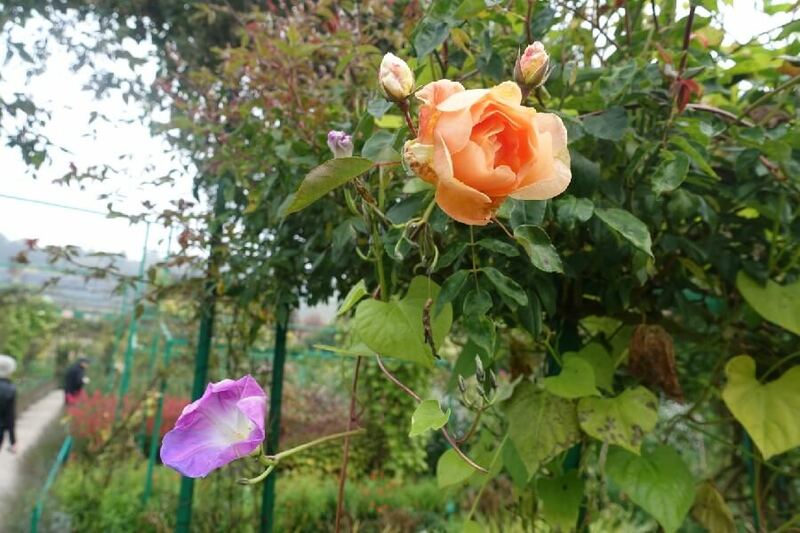 You will enjoy Giverny in the autumn. Going in the fall sounds wonderful! Please can you tell me how far into October you were there? Is early October best, or would it still be nice around the 20th? I came across your site after searching for Giverny in fall. 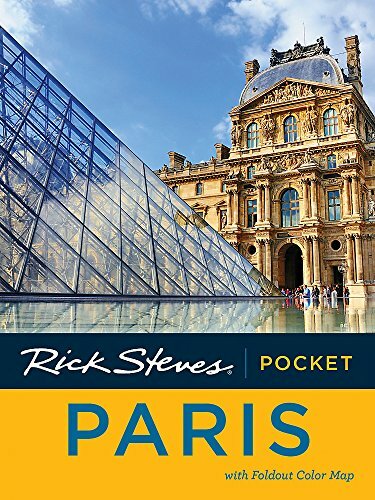 Going to be in Paris in mid-October and was on the fence about visiting so late in the season. Looks like I’ll be visiting after all! Thanks for the lovely and helpful post.